It’s been quite a number of years since we saw the character Jack Ryan save America from an impending doom. It’s been twelve years in fact since ‘The Sum of All Fears‘ where Ben Affleck played Jack Ryan. Before him was Harrison Ford in ‘Patriot Games‘ and ‘Clear and Present Danger‘, and Alec Baldwin played the hero character in ‘Hunt for Red October‘. This time around we receive a much needed reboot to the franchise, and let me be the first to say, this is a solid action spy thriller. I can’t wait for the sequel. Shakespeare vet Kenneth Branagh plays double duty here as director and actor. This is actually the first time Branagh has directed himself since the 90s ‘Hamlet‘. Plus anytime Branagh plays a sadistic villain is gold. This 100 minute heart pounding action movie is quick, smart, and keeps the suspense high throughout the entire flick. With some solid performances by everyone involved and some of the best car chase sequences of recent memory, this should be the film you see this weekend, and I expect and hope for the box office returns be enough to warrant a good sequel. With ‘Jack Ryan: Shadow Recruit’, we get an origin story of sorts with Chris Pine playing the titular Jack Ryan role. It’s funny, because Pine is now Captain Kirk in the new ‘Star Trek‘ films, which was also a reboot and origin story. We start out in the year 2001 where Ryan is over in London studying Economics and watches the Twin Towers fall in NYC on September 11th. Cut to a few years later high up in a helicopter where Ryan is now a Marine. The helicopter is struck by a missile and Ryan ends up in physical therapy for a while to learn to walk again. However, his determination by his doctor Cathy Muller (Keira Knightley), who he is in love with and the sudden appearance of CIA operative Thomas Harper (Kevin Costner) fast track Ryan’s recovery as he might just have a new job with the CIA as a financial analysis. Cut to present day where Ryan is an undercover CIA analysis on Wall Street where he Cathy live together and he leads a fairly normal existence. But just like in the 80s, the Russians are back to wreak havoc on the sweet freedom of America and destroy us all. 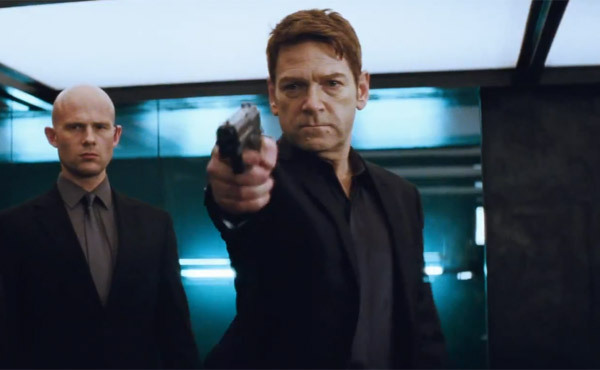 This is where Branagh comes in and lights up the screen with his evil ways and Ryan is forced to switch from economist to ultimate spy as he dodges being killed by everyone around him, dives fast motorcycles and cars, and has to kill any Russian that steps in his way. Branagh did a great job with the fight scenes as nothing was too quickly edited and we got to see Pine and his foes battle it out nicely. The car chases scenes are the best here and proves that Branagh knows how to keep the suspense all the way through a chase. I swear I was on the edge of my seat the entire time. There is not much in the way of special effects here, as most of the stunts looked practical with no CG, with the exception of some of exteriors of Russia, which looked more like a Candyland board game than an actual city. Pine does a solid job with Jack Ryan. From his struggle in therapy to him realizing who he has to become to stay alive is done very well by Pine and I always believed he could take out anybody bigger than him in the film. Costner again turns in a solid performance and was cool to see him snipe enemies. Knightley does well, but turns on the cheese factor a bit in a few scenes, but as always she is beautiful and charming, even with an American accent. Then there is Branagh himself who gives a great villain performance as the big bad evil Russian guy who is not above torturing and killing women. Since his portrayal of Iago in ‘Othello‘, this is his best villain performance. This is a great start to a reboot of the ‘Jack Ryan‘ franchise and this should be the film you see this weekend. This entry was posted on Thursday, January 16th, 2014 at 11:34 am	and is filed under Film, News. You can follow any responses to this entry through the RSS 2.0 feed. You can skip to the end and leave a response. Pinging is currently not allowed. « ‘Veronica Mars’ Is Getting a Spinoff Series! !